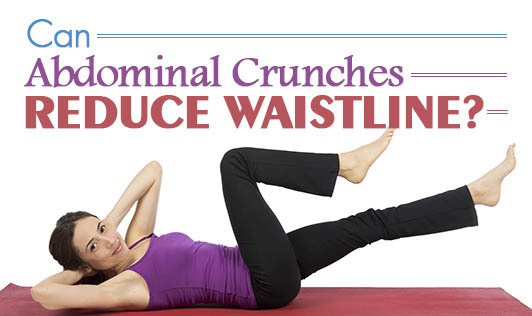 Can Abdominal Crunches Reduce Waistline? Abdominal crunches are suggested by many gym trainers for fat loss around the tummy. Do they really burn fat? Are ab crunches the only way to reduce inches around your waistline? The fact is that there is no such thing called 'spot reduction'. Whether it is general weight loss you're looking for, or inch loss around waist or thigh or arm, the loss will take place only with regular exercise and a proper meal plan. When you begin a weight loss program, the diet and exercise help you to lose fat and / or weight from your body. Since fat loss can take place from various parts of the body where its accumulated, there's no saying which particular part of the body will begin to lose its size. Morevoer, the weight loss or inch loss cannot happen overnight. However, in order to keep your abdomen region well toned, you need to exercise the muscles in that area. Ab crunches help to tone up the muscles in your abdomen. Your diet is also equally important to maintain toned abs. Remember that full-body exercise is important for a healthy body and abdominal crunches should be only 10 to 20% of your total exercise!